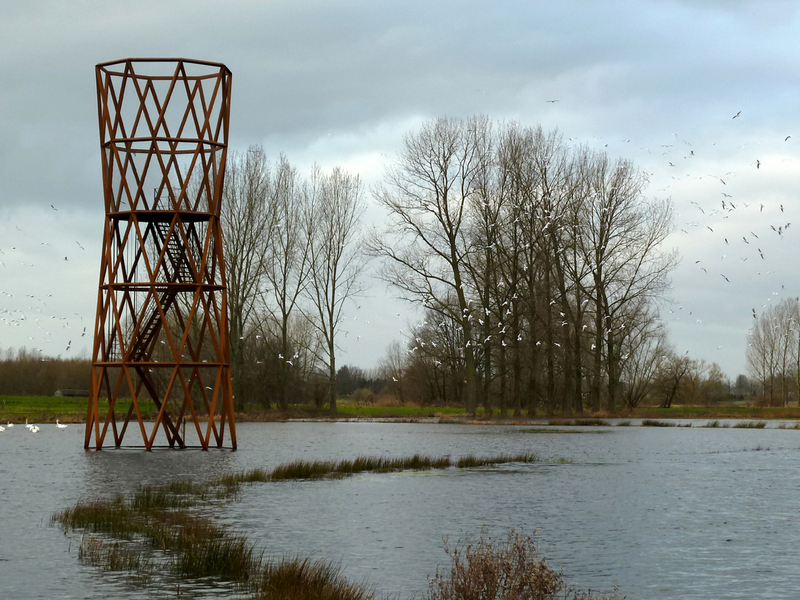 The watchtower ‘Rond door Recht’, roughly translated as ’Circular by straight means’, is a new addition to the Brabant landscape near Sint-Oedenrode. 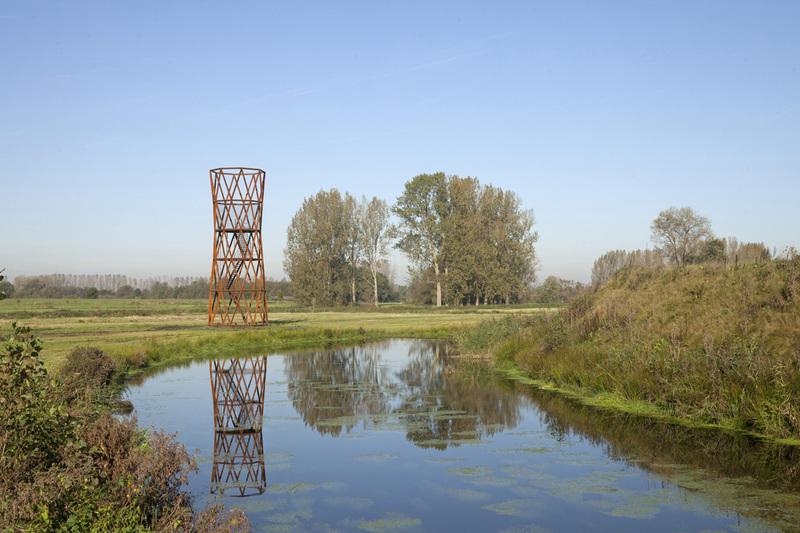 The functional sculpture was commissioned by Water Board ‘de Dommel’ to complete the new developments and renovations at their sewage treatment plant. The conceptual design of the plant is a first; it is not merely designed as a very efficient and functional plant, but parts of the process are integrated in and make use of the landscape. The Water Board wanted to communicate to visitors this new integration of natural and constructed elements. To do this, they commissioned Lucas Lenglet to create a structure that would give visitors a clear overview of the plant and its layout. He designed a transparent tower with a viewing platform. 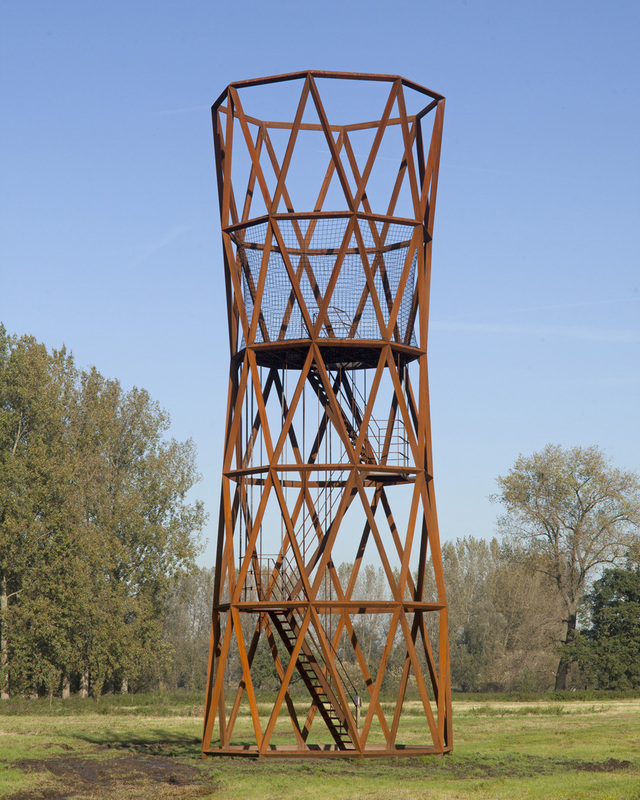 Standing 15 meters tall, the watchtower ‘Rond door Recht’ gives a perfect view of its surroundings. The plant is situated in an agricultural landscape with the river de Dommel flowing directly next to it. The purified water is drained into this river. 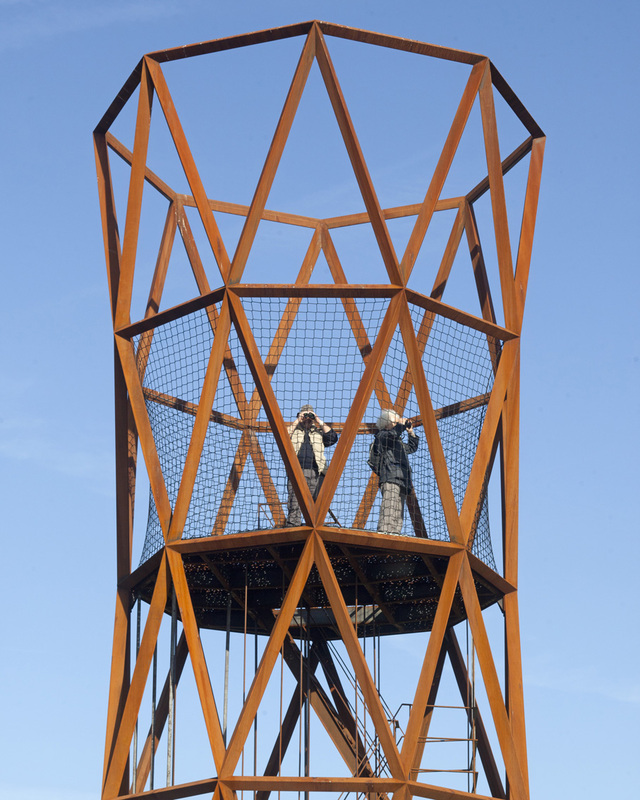 The tower is built in the wash lands of the river, which is also the overflow area of the sewage treatment plant. 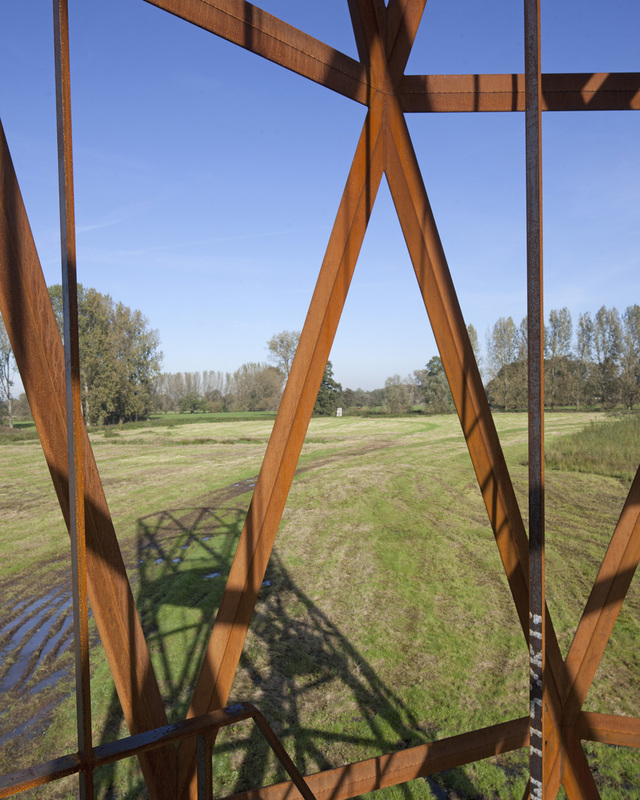 In reference to the characteristic coulisse landscape, with its semi open views comprising clusters of trees and flowing grasslands, the watchtower is a transparent structure equal in height to the surrounding poplars. 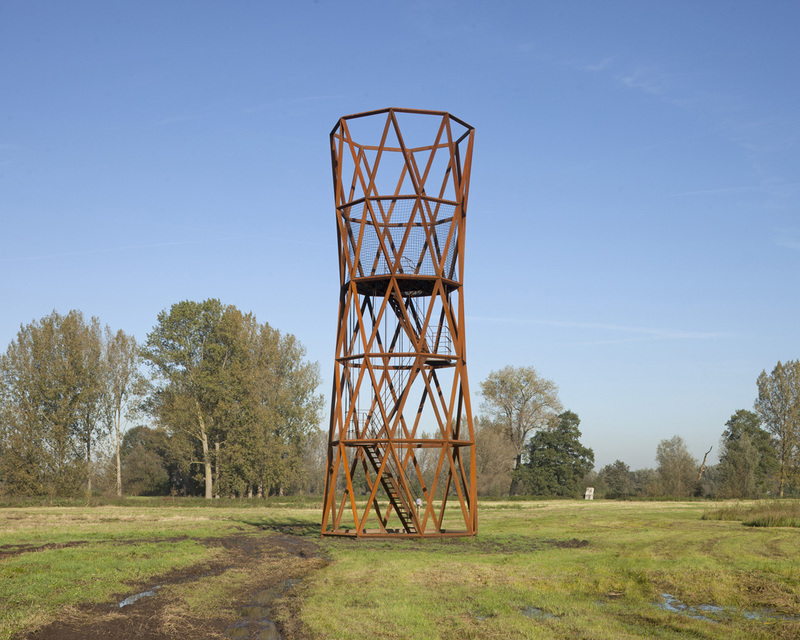 The tower gets its double identity as both a man-made and natural landscape element from its structure of straight, but inclined, steel elements that form into a tubular shape. The tube relates to the circular basins of the sewage treatment plant and to the surrounding trees. The columns with their unnatural, triangular section create tension and emphasize the tower’s sculptural quality. 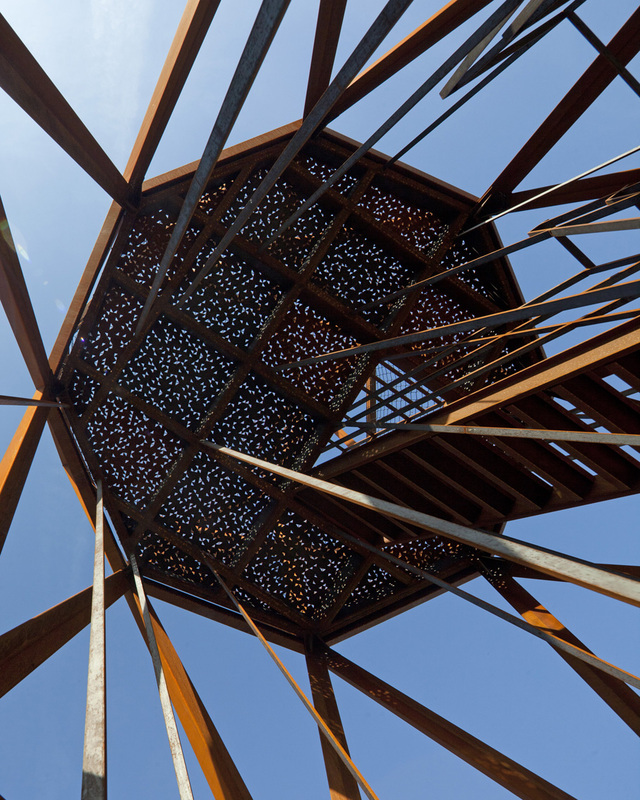 Sustainability of the structure is guaranteed by making it completely out of CorTen steel, a material that will corrode very slowly. Over time the colour and texture of the tower will change from the smooth, steely look it has now, to a rougher, more earthly dark brown look and feel in a few years. 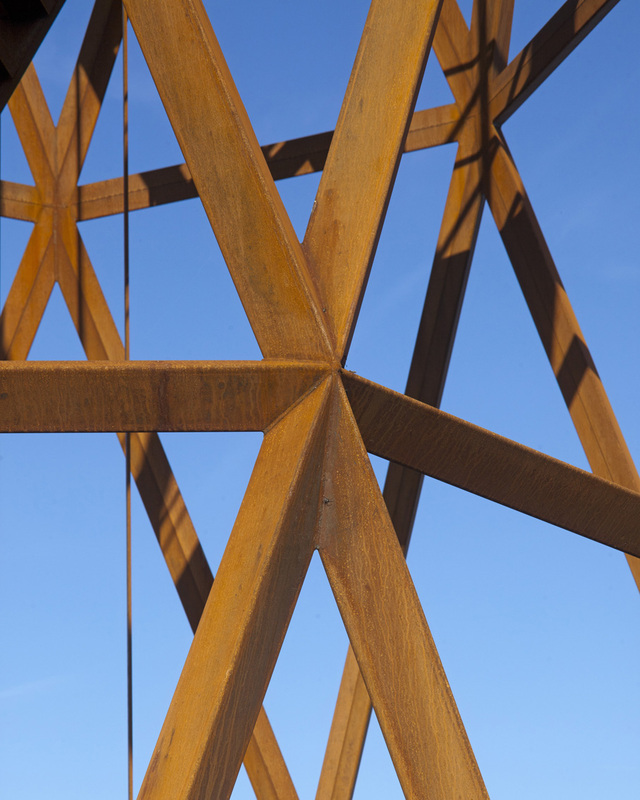 The columns are made by folding 3mm thick steel plates into triangular shapes and the sides are welded together to yield a closed, stiff element. 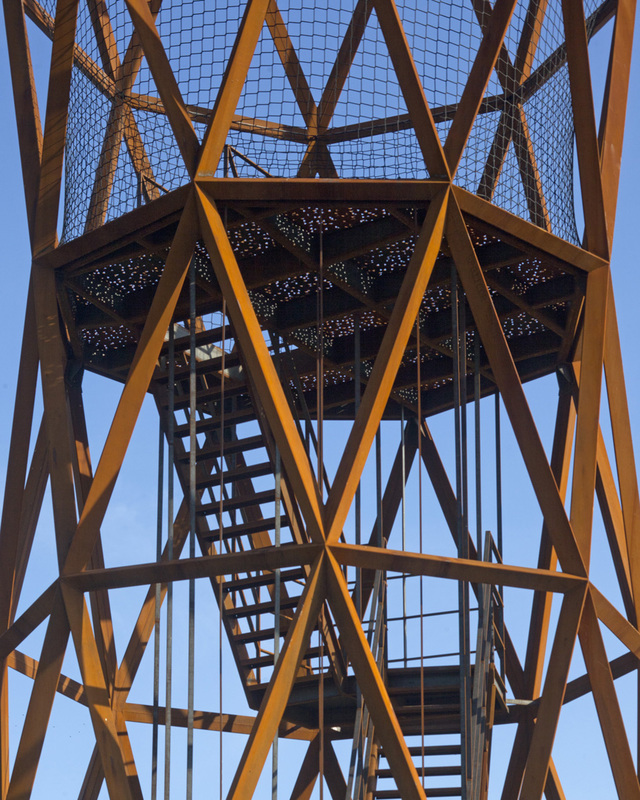 Five layers of 3 meter high rings of different diameters have been stacked together to raise the tower up to its full height. 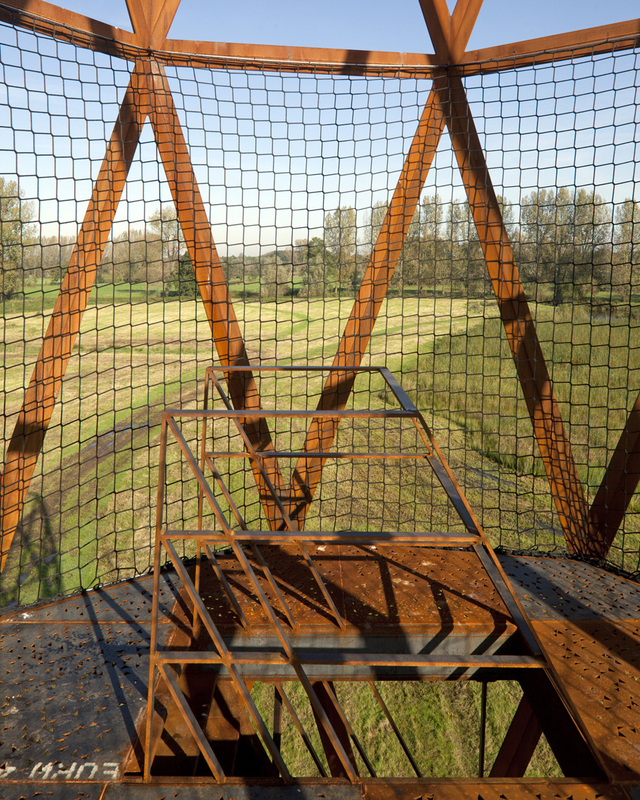 At the top of the third level, 9 meters up in the air, a viewing platform is supported on the structure. From this platform three sets of stairs are suspended by a sensational bundle of tension bars. 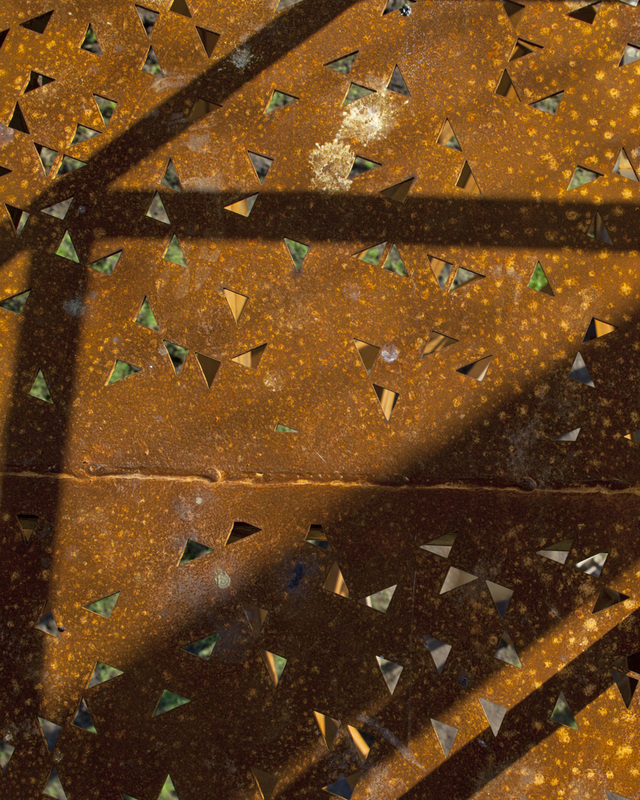 The laser-cut perforation pattern of triangles reflects the main structure and provides both a view through the platform looking up and down when standing on it.